FOSSwire has been around since October 2006. That means we've got a pretty impressive (if I do say so myself) back catalogue of posts on all sorts of FOSS and Linux related things. You can search our archives by using the Google-powered search box on the homepage, but what if you'd like even closer access to our posts from any site? Well, now you can add FOSSwire to your browser's search bar (in any browser that supports OpenSearch, including Firefox 2 and later). 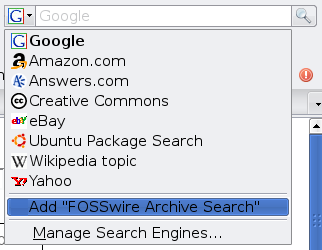 Simply click the search drop-down, and choose to add the FOSSwire Archive Search. Now, you can select it anywhere you are on the web to do a quick search of our archives, or even keep it at the top always, for the closest access to FOSSwire currently possible! © 2006 - 2010 Oratos Media. FOSSwire is an Oratos Media property. Content is made available under the CC-BY-SA 3.0 license.